If there’s any way to tell how big the robot revolution is, it’s by looking at how many robots are being sold. 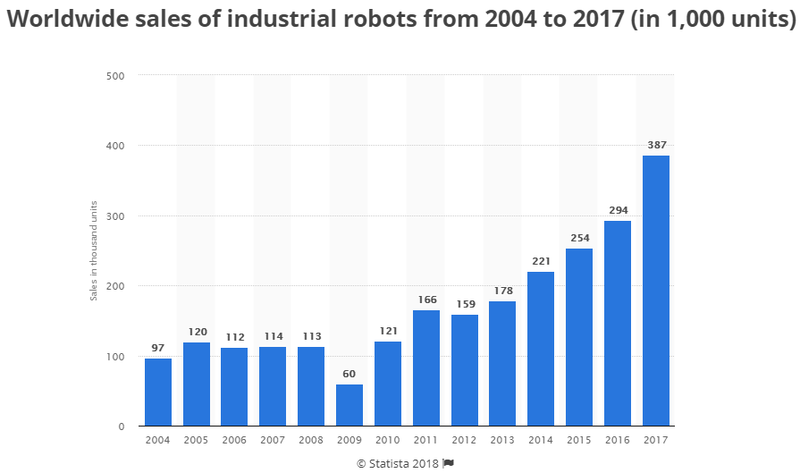 2017 saw robotics sales blow by the previous record, totaling 387,000 and growing by about 32% from 2016. That sort of growth is extremely high. Especially when you consider that it’s for the entire world and not just a top market or country. To put it in perspective, it’s about 10 times higher than the average growth of the S&P 500 Index. Last year, IFR World Robotics set its expectation for global sales at 521,000 by 2020. That’s a huge increase from where we are today. But sales could be even higher. IFR’s estimate for this year was 346,000, and that has already been beat by over 40,000. So what we’re seeing is a revolution taking place that’s outpacing expectations by a huge amount. If we see equally high growth this year as we did in 2017, sales will have tripled in just six years. That’s an industry we want to invest in! Robots are so popular right now that new exchange-traded funds (ETFs) are being created left and right. Two of the most popular are the Robo Global Robotics & Automation ETF (NYSE: ROBO) and the Global X Robotics & Artificial Intelligence ETF (NYSE: BOTZ). Another way to play the robotics boom is by investing in Japan. As of last November, 52% of robots were made there. So, right now it’s far and away the leader in the field. To invest in Japan, I recommend buying the WisdomTree Japan Hedged Equity ETF (NYSE: DXJ), which holds over 250 Japanese stocks. The biggest holdings in this fund are auto companies. That’s perfect since auto is the leading industry in adopting robotic technology. As robot sales continue to climb and boost Japanese stocks, this ETF will benefit.